The Current Health Scenario. : Worried About Tetanus? Get the Facts. One of the most common emergency questions that we have is about tetanus. The best thing that you can do is to prepare your mind for the tetanus question in advance. The following is an article that I wrote to give you some tetanus basics in a way that should be easy to retain, so that you will have confidence when faced with an emergency tetanus shot pressure situation. Please read it thoroughly and let me know what you think. Maybe there's some information you think is missing or that isn't quite accurate. I tried the best I could to be accurate, but I was just writing it from my own personal research. Please chime in about your personal tetanus shot related experiences, questions, or information. 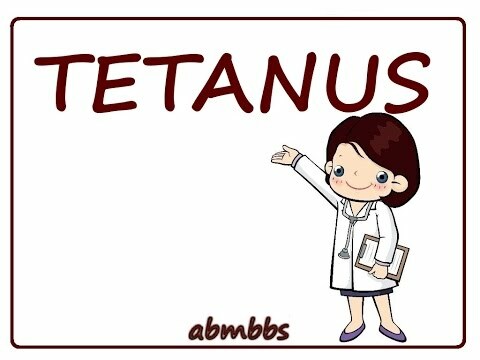 Tetanus Basics: what it is, how to get it, how to avoid it. Tetanus is a sometimes serious disease that comes from clostridium tetani that can ultimately cause rigid paralysis, which can sometimes, but not usually, lead to death. Usually, recovery from tetanus occurs within a matter of a few weeks to a few months. It's important to know that most tetanus infection (80%) is merely spasms, but it can sometimes lead to localized paralysis which can cause, serious and sometimes fatal conditions, so it is not a disease to be taken lightly. How Does Tetanus Cause Paralysis? The incubation period of the tetanus spore is 8 to 14 days with a life cycle of about 8 days. When the clostridium tetani completes its 8-day life-cycle, it releases a toxin called tetanospasmin. This toxin can then block nerve transmitters that allow muscles to relax after they have constricted. When this happens, the muscles can stay in a constricted state. This may cause affected muscle groups to not go through their normal process, rendering them ineffective. An example of a serious consequence of clostridium tetani would be when the lungs are affected. If a lung in a state of paralysis can't relax, it can't complete the process of oxygenating the body, so suffocation could result if a large portion of the lungs were affected. Think of other areas that could be affected: swallowing, defecating, blinking, etc. So yes, tetanus is serious and should not be ignored!!! How Often Does Tetanus Result In A Fatality? Known tetanus cases result in statistical fatality about 10% of the time. This is no insignificant percentage, however, it doesn't tell the whole story because we don't know what else was going on with the infected person when they passed away. An example of a questionable tetanus-related death would be a farmer who had a tractor roll over onto him, giving him crushing injuries. There is no test for the presence of tetanus, so only a clinical diagnosis can be made based on the presenting symptoms. If the aforementioned farmer died, his death would be attributed as a tetanus-related death, even if there were other conditions that actually led to his death. Where Is Tetanus-Causing Clostridium Tetani Found? Clostridium tetani's natural habitat is the soil and even dust. However, it is often introduced to the digestive system of ruminants (animals that chew cud) and other animals that might eat vegetation that can bring up soil from below the ground's surface. (example, dogs, chickens, etc.). The spores exist harmlessly in the dust of most any kind of surface, soul, intestines, saliva, etc. The spores and bacteria's presence alone do not cause tetanus. It is only when the bacteria completes its life cycle and releases the toxin tetanospasmin that tetanus can occur. What Is Something Important I Need To Know About Clostridium Tetani? It is characteristically anaerobic by necessity. Anaerobic basically means it can only begin its lifecycle in places without oxygen. In fact, in the case of clostridium tetani, the presence of oxygen causes c. Tetani to form protective spores which cause it to fall dormant, preventing it from breeding or growing. In other words, the best way to neutralize clostridium tetani is by introducing oxygen. BLOOD has oxygen. Air has oxygen, so … the best way to insure that any accidentally introduced clostridium tetani doesn't cause nerve damage is to breathe on it … or get your blood to breathe on it for you! I just was injured, cut, etc. Or am about to have surgery. Should I worry about tetanus? Are you bleeding? If so, let it bleed any other yuckies out, but tetanus is NOT a concern for you. Is the wound deep? If so, is it bleeding? If it is, the above applies, and you have no tetanus worries, but don't let yourself bleed to death! Do you have a gash that needs stitches? If so, tetanus is not going to be a problem, but get stitches. I’m sure the needle they use won’t give you tetanus either! Did you break a bone that is still beneath the surface of your skin? Tetanus is not going to be a problem. Did you break a bone that has broken through the surface of your skin? Tetanus COULD be a problem if … you packed the broken wound with soil or animal feces, so don't do that! If you don't do that, tetanus will not be a problem. Note: if you broke your bone by being thrown from a bull in a rodeo and you got rodeo dirt in your break, tetanus COULD be a problem, but don't worry … we'll eliminate that as a problem in a bit. However, getting back on the bull could be a problem because … well … never mind! Have fun and keep your life insurance policy current! Is the surgery you are about to have going to be done on the dirt floor of an animal stable? If so, tetanus COULD be a problem. Is the surgeon planning on using surgical tools that were stored on the dirt floor of the barn that are wiped off to remove the manure that was caked on them with his shirt tail before using them on you? If so, tetanus will not be a problem, but … find another surgeon anyway! Do you have a puncture wound? If yes, you're getting into an area that tetanus COULD be a problem. Is the nail so rusty that the rust is flaking off? And, if so, tetanus COULD be a problem. Is there a chance that seriously brittle flaky rusty nail got buried in soil or feces AFTER the rust formed allowing for the potential that clostridium tetani spores got packed behind the rusty flakes, so that when the rusty nail penetrated your flesh the flakes “flaked off” exposing an anaerobic environment that the clostridium tetani could survive? If so, tetanus COULD be a problem for you. Did you get a puncture wound while wading in mud or feces by something that was in that mud in feces? If so, tetanus COULD be a problem. Did you step on a tack in your home office or a nail that just spilled out of the box you just bought for your home improvement project? If so, clostridium tetani will not be a concern … unless the tack and nail were also buried in soil or feces when you stepped on them. If they were buried and soil and feces earlier, but you wiped them off before stepping on them, then you're in good shape as far as being protected from tetanus! Are you still not sure about the condition of your puncture wound? If so, don't panic. There is hope ahead. Have you burned yourself or otherwise caused cell damage on the surface of your skin? Depending on the depth and severity of the burn or cut, it could be a potential problem. If it was a deeper burn where the skin was seared away, depending on the environment and treatment plan, there is a chance for tetanus spores to enter those areas of dead tissue and begin their life cycle. For most household burns, just making sure that the area stays cleaned and cleared using a debridement technique of flushing regularly with clean water is typically going to be sufficient. If you are really worried, then look for the other hope that is ahead! I Just Read The Above List, And I'm Still Concerned About Tetanus, What Should I Do? Clean the wound thoroughly with soap and water and let it bleed enough to flush it with oxygen from the blood. For deep puncture wounds or serious surface wound like a burn that fall into the “COULD BE A CONCERN FOR TETANUS DEVELOPMENT” category, I recommend thoroughly cleaning the wound with colloidal silver or clean water to cleaning out any debris that could cause an infection. And then squeeze the wound as much as possible to get blood out of it. The main purpose for this is that blood is oxygen rich and will neutralize the anaerobic clostridium tetani. Clostridium tetani is very easy to neutralize before it has a chance to begin it's 8-day life cycle that can release the tetanospasmin that could block your essential nerve transmitters. Would It Be A Good Idea To Use Hydrogen Peroxide Instead Of,Colloidal Silver Or Water To Clean My Puncture Wound? Great question! Afterall, hydrogen peroxide is water with an EXTRA oxygen molecule (H2O2). But don't use it on a puncture wound, and only use it initially on other wounds. That extra molecule is unstable (which is why it fizzes) and can actually kill cell tissue. If flushed into a puncture wound, it could actually promote dead tissue inside the wound, which is a smorgasbord that could help clostridium tetani thrive. Don't be tempted to cut it half with water either. Just use water; it has oxygen too! Having said that, hydrogen peroxide IS excellent at destroying tetanus, but it may be at a cost you don't want to pay. I Have Cleaned My Wound, And I'm Still Really Concerned. Should I Get A Tetanus Shot? NO!!!!!!!!!! For one thing, the tetanus shot is ALMOST ALWAYS a trivalent vaccine which also contains the diptheria and pertussis vaccinations. Also, if you already have clostridium tetani in your system, the vaccination has no chance of working in a timely manner to prevent tetanus. It was designed to prevent, not treat, tetanus. Ask your healthcare provider for the tetanus immuno globulin (TiG) if you have concern that you may have been exposed to clostridium tetani that you don't feel you can adequately neutralize by bleeding or cleaning. This TiG is NOT a vaccination! It merely introduces the antibodies to fight the bacteria that may already be there in order to prevent them from affecting the nervous system. It is better than the shot because the shot is designed to assist your body in forming the antibodies for itself, which is not time efficient as having them available as soon as they're needed. If the health care facility doesn't have the TiG, and you want it, don't panic. You have a minimum of eight days before the life cycle is complete and releases the concerning toxin, tetanospasmin, so wait for them to restock it or find someone who has it on hand. But … check the label. It's not unheard of for them to mislead you into believing you're getting the TIG, when, in fact, they are giving you the trivalent tDaP, TDaP or DTaP vaccinations. I have a strong suspicion that I may have been exposed to clostridium tetani, but i have had my tetanus shot and the boosters at the CDC recommended schedule, with the most recent having been administered a couple months ago. My doctor told me that I don't need the tetanus shot because I am protected by the vaccination. I'm safe from tetanus; right? WRONG!!!! Between 1995 and 1997, there were 124 suspected cases of tetanus with 14 resulting in a fatality. Of these, 64 had unknown vaccination status. They may or may not have been vaccinated, but if they were asked, they knew they didn't refuse the offered vaccination, so they weren't anti-vaccine and certainly didn't refuse the vaccination at the time of seeking medical treatment at the time of the suspected tetanus exposure. However, it must be realized that some of these people may not have sought medical attention at all at the time of the injury, so it may not have been offered. Of the 60 with a KNOWN vaccination status, 27 had not had any doses of tetanus. These 27 comprised 4 of the 14 suspected tetanus-related deaths. Again, we don't know what else might have been going on with these people at the time of their death. Of the 60 cases of tetanus with known vaccination statuses 33 of them HAD RECEIVED VACCINATIONS, so don't assume safety simply because you are vaccinated. Still follow the protocol of introducing clostridium tetani-neutralizing oxygen and, if indicated, ask for the tetanus immunoglobulin (TiG) to be administered within 8 days of the suspected introduction of the spores. Tetanus does not create its own immunity after it is contracted, yet people often show immunity when a titers test is run. People who show protective antibody levels to tetanus still have ended up getting tetanus and even dying from it, so you have to ask, why give a tetanus shot if it doesn't honestly hope to be protective? People who live in very poor conditions, many of the people of Ethiopia, and have never received a tetanus vaccination demonstrate a strong resistance to tetanus, likely because of constant exposure to the spores that are virtually everywhere that dirt is. People with better blood circulation seem more resistant to tetanus. (Elderly people are more prone to developing tetanus.) People who spend a lot of time playing in the dirt also have a higher resistance. But … why chance it? Case studies have demonstrated that fully vaccinated individuals contract tetanus at a higher rate that never vaccinated individuals. Why? Maybe a compromised immune system, maybe c. tetani feels more at home where it was willingly injected during times of health! I don't know. But I know enough to not ever have a false sense of security because I recently received a TDAP shot or because I have always maintained an intact immune system by not being vaccinated, and now you do too! Does this help? Do you have more resources to add? Send me an e-mail at DebiQ1830@GMAIL.COM with “TETANUS BASICS SUGGESTIONS” in the subject line, so I don’t dismiss it as spam.